Cura Personalis is a Latin phrase used by the order of the Jesuits. It denotes care for all aspects of a person's health, from the physical to the mental and the spiritual. It encompasses our responsibility towards others. And it also has a relevance that echoes beyond religious cloisters to today’s world of work, which, as I’m exploring in a series of blog posts, needs to be thoroughly re-evaluated. These are the questions that we should be asking ourselves, but all too often overlook. Are we fit? Do we have healthy, rested minds? Do we sleep deeply for at least seven to eight hours a night? Do we walk enough? What and how much do we eat? Our physical state affects our cognitive and emotional abilities – and our capacity to perform at work. Few things undermine us quite as dramatically as a lack of sleep. As an article in the Ashridge Journal explores, sleep deprivation played its part in the human errors that led to the Chernobyl nuclear explosion, the Exxon Valdez oil spill and the Challenger space shuttle disaster. On a more humdrum level, sleepiness takes its toll on our social and working lives. A lack of sleep reduces the quality of our decision-making, while sapping our adaptability, creativity and self-control. Would you take important decisions or drive a car after three glasses of wine? Of course you wouldn’t. But this is exactly the effect that 18 consecutive hours of being awake has on your cognitive skills. Losing just 90 minutes of sleep reduces daytime alertness by one third. A lack of sleep causes symptoms including headaches, poor vision, lethargy and an increase in appetite. Moreover, a recent Scientific American article reveals that sleep is essential for "brain drain": an internal plumbing system that rids the brain of toxic wastes. From new scientific studies to the old piece of folk wisdom that the best way to take an important decision is to sleep on it, it’s clear that we are doing ourselves no favours when we skimp on sleep. Speed; flexibility; the ability to solve problems, to remember, to pay attention – these are all skills that we need to nurture and protect, both in and out of the workplace. And they all rely on a reasonable amount of sleep. 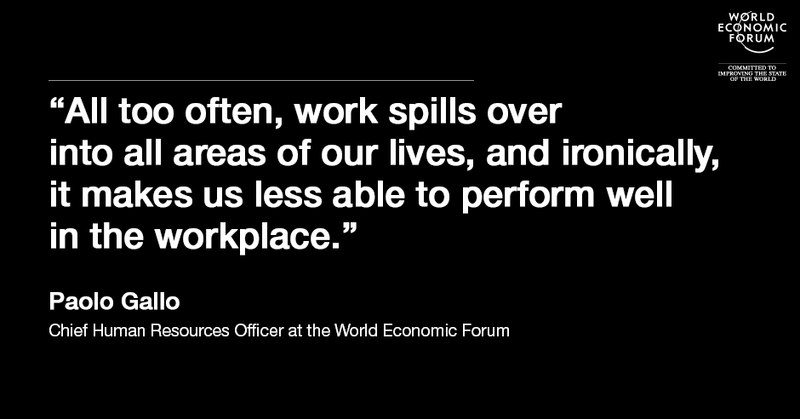 All too often, work spills over into all areas of our lives, and ironically, it makes us less able to perform well in the workplace. Here are some more essential questions. Do we ever really detach from our working lives? Can we stay in absolute silence and enjoy it? Can we reflect and meditate? Can we make time for exercise? Do we walk at least 10,000 steps a day, the target recommended for maintaining our health? The benefits of looking after ourselves physically and mentally are manifold. People who exercise, especially in the morning, can be in an energetic, positive, productive mood for as long as 12 hours after the workout. So what can we do to safeguard our health? Let's try, for example, to turn off the phone from 8pm to 8am, to play sports or even just take a long walk at least three times a week, to drink at least 2 litres of water a day, to improve our diets, to reduce alcohol and coffee, to stop smoking, to take a real digital detox by going on vacation in a place without an Internet connection. Let’s try to breathe slowly, to sleep 15 minutes more per day until we wake up rested. These are small steps that we can implement relatively easily. So why don’t we? We are perpetually caught, I'd say lost, among a thousand messages, meetings, interruptions and interferences. Instead of taking time to think, we react quickly, as if we were in a constant battle against someone. We lack time to reflect; to think about the way we think. I confess that at times, after a day in the office, I have the impression that I have been in a video game with special effects, where everything is happening faster and faster in a seamless blur. But the faster things get, the more we need to pause and to reflect. We need to turn off the smartphones that are turning us into zombies, control the anxiety of being connected 24 hours a day, and reconnect with our real selves. We need to stop worshipping the cult of speed, pause, reflect and regain control of our lives. The thinking behind Cura personalis has a profound human value and, above all, a spiritual one. We all hopefully have at least one person who loves us and whom we love in our lives. Do we have the space and energy to give enough of ourselves to the people we really love, and to our community? Can we count on a support group or a genuine friend with whom we can talk without being judged? Can we give space to our creativity, our artistic side and our spirituality? Do we remember how it felt the last time we saw a starry sky, a sunset by the sea, a snowfall in the mountains, a rose in a garden, the smell of wet grass after rain? When was the last time we had the opportunity to devote quality time to being in touch with nature? How much of ourselves are we prepared to sacrifice to our overflowing inbox, our ever-present smartphones? Can we listen and observe what happens around us and inside us? The quality of our decision-making will improve by waiting – as opposed to anxiously procrastinating – in order to listen to other views and consider options we miss as we hurtle along at 100 miles per hour. In conclusion, Cura personalis could become not only a way of defining our fitness in the conventional sense, but also a way of reminding ourselves that we need to ensure we are fit to lead authentic lives, where we are in control of our wellbeing, both in and out of the workplace. It’s part of ensuring that we live our lives on a speed and scale that is human, not part of an ever-spinning machine.